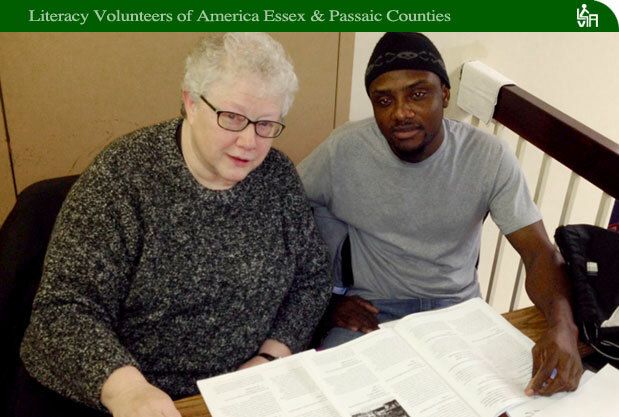 2015-16 - Literacy Volunteers of America, Essex & Passaic Counties, NJ Inc.
We all enjoy success stories. They are positive messages about overcoming obstacles, working hard for the reward, and finding satisfaction in completing challenges. Read about the students who have obtained citizenship, those who escaped war torn countries and now have assimilated into American society and absorbed our culture, and those who finally read a bedtime story to a young child or grandchild. That last achievement has a special significance for a Basic Literacy student after a lifetime of frustration and low self-esteem. Here at Literacy Volunteers of America we like to celebrate all those positive events in our students’ lives. Sometimes we celebrate with hugs and treats, but most often, we share these achievements with others through this page on our website. That way all of our LVA community can share in the celebration of their success! 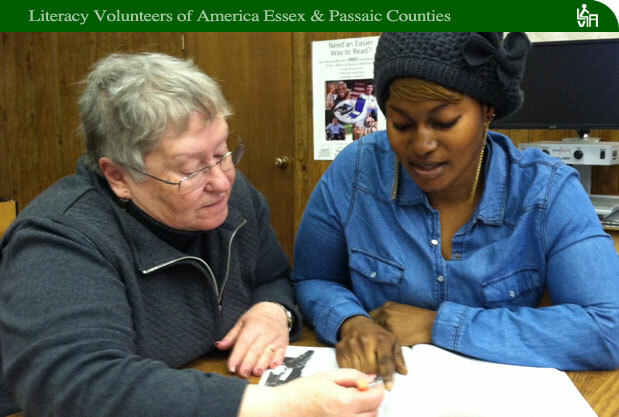 When Latifah first came to Literacy Volunteers of America, she cried and we cried with her. She could neither read nor write. Latifah was desperate to learn to read both for herself and her young daughter. “I first came to LVA because I needed help with my reading and writing, “ Latifah said. “I was trying to better myself. My daughter was 5 and I wanted to be able to read to her,” she added. Latifah attended school in Newark through 8th grade and was a product of a failed system. Realizing that school was not helping her, she dropped out in 9th grade. Latifah has been working with Mary for almost two years. Their relationship goes far beyond tutor-student. Mary is also her mentor and friend. She is always ready with a listening ear and kind heart. Together, Mary and Latifah have developed an engaging method of study that they call a “word board.” Latifah said, “It is a beautiful, nice board that we made together. Mary purchased a project board and I put sticky strips on it.” Together they wrote nouns, verbs, and punctuation marks on index cards and they attached them to the board. In addition, Latifah is diligent about doing her homework. “At home I study the words we learned that day. When I come back, Mary is so happy that I know the words.” Latifah’s success is due to the dedication on both the student’s and tutor’s behalf as they meet twice a week for two hours each day. In his award-winning memoir, “Rising Above,” LVA student Barry Batts wrote unwaveringly about the challenges of his life and how he achieved the positive outcome of his quest. Barry never received the formal education that he deserved, but as an adult, he was going to let nothing stop him. At age 50, he came to LVA. Barry was determined to overcome his difficult circumstances. “At 55, I have struggled hard for the good place I am in life. I am currently working with my tutor to improve my reading and writing,” Barry said. 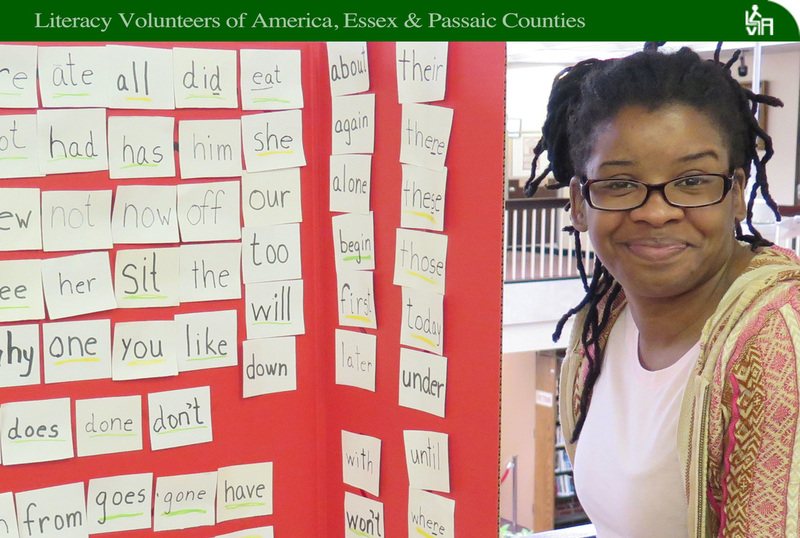 At the Passaic Public Library, where he attends classes nearly every day, Mickeal Belombe is an avid student of the English language. But in the fitness world, where the personal trainer once guided the health program of Senegal’s first lady, there’s little doubt: Mickeal is a master teacher. Mickeal recently sold his gym, a Curves franchise in Senegal, and moved to the United States with his wife, a respected newspaper foreign correspondent. Mickeal was quick to find clients as a personal trainer in New Jersey, where he works all types of schedules at a 24-hour Bergen County fitness center. Finding work was not his challenge. “When I first came to the United States, I knew ‘Hi,’ ‘Hello,’ and then I was finished,” he said of his language difficulties before enrolling in LVA classes. “I can now speak and write English,” he added. 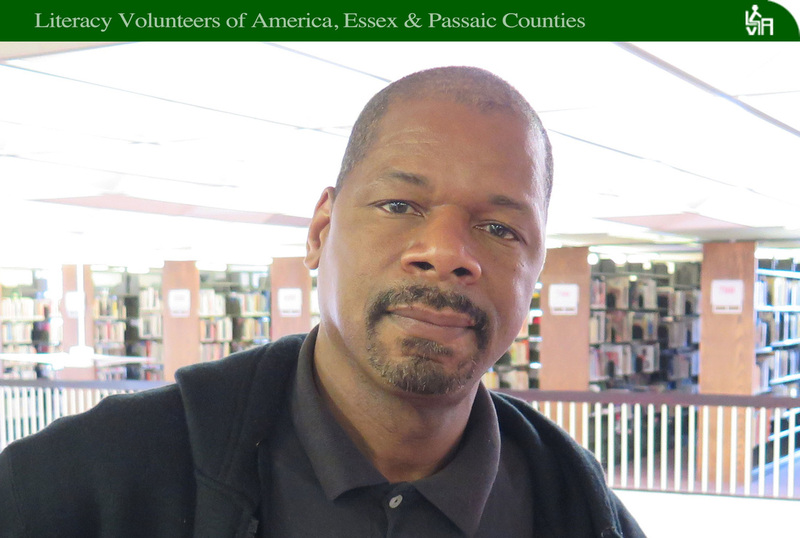 This is Mickeal’s second 10-week session at the Passaic library and plans to attend LVA’s ESL program at Berkeley College in Newark, which is offered four days each week beginning April 11. He first became interested in fitness in his native Cameroon, where he played soccer, enjoyed running and practiced all forms of martial arts. 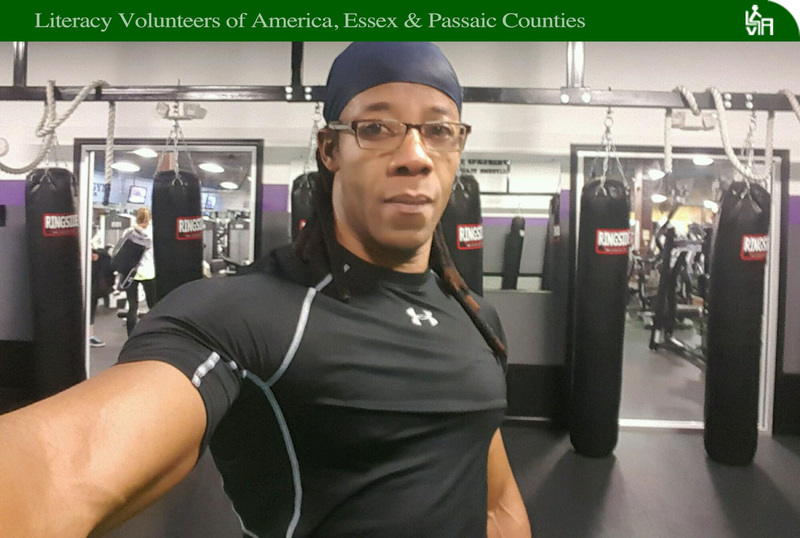 When Mickeal is not taking English classes you can find him in Bergen County teaching “Slim Cardio,” a program he named and developed. It is a very fast workout program that also includes some basic martial arts. His is an erratic schedule, with ESL class nearly every morning and fitness sessions with clients at all hours of the day and night. At the end of his long recent shift last week, he said, “I am tired. I can only think of my bed.” This is the only time he seems to slow down. Born on the eve of one of Africa’s worst civil wars; Nunu was abandoned and placed in a bin, left to the good will of any stranger that would come to her aid. Nunu would eventually learn she was one of 11 children. She met her father when she was 10 yet opted to stay with the woman who found her, unofficially her foster mom, until she was 20. Her childhood education was limited. Nunu came to the U.S. nine years ago; her transition has been anything but easy. She had difficulty understanding American English, which differs from what she calls the “broken English” she learned at home, and it led to her social isolation. She worked a series of menial jobs, often holding down more than one at a time, while getting very little sleep at her father’s crowded East Orange home, which she shared with 10 others. She eventually moved to her own apartment in Newark with an older sister. Since coming to the U.S. nine years ago, Nunu has earned her GED, became a U.S. citizen, obtained a driver’s license and made advancements on her job. She started as a home health aide and, after months of study, passed an exam that led to her current dispensing medication at a mental health facility. Nunu said she plans to attend community college and become a Registered Nurse “I really want to be the first one in my family to go to college,” she said. Different countries. Different backgrounds. One big family. Every Wednesday, the conference room at the Bloomfield Library resonates with sounds of laughter and lots of talking. 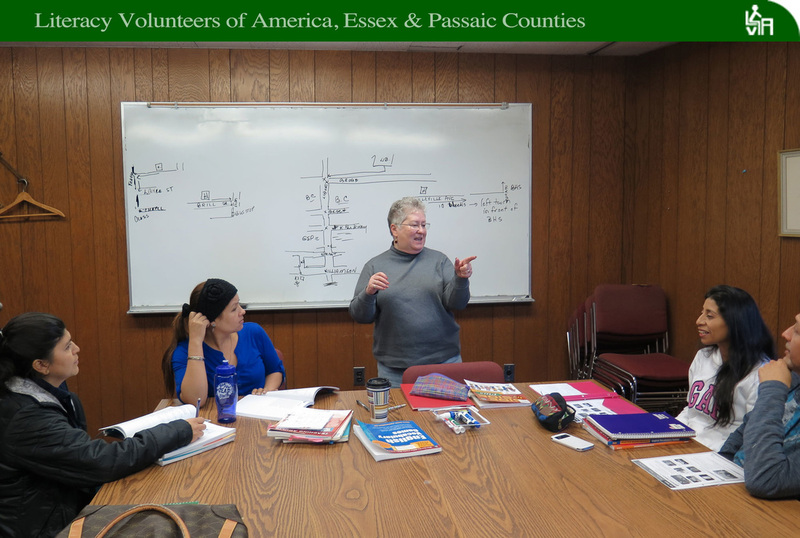 Literacy Volunteers of America tutor Mary O’Connor is teaching her group of four students, Mariana, Ligia, Maritza, and Esteban, who come together each week to hone their English skills. Mariana, who has been studying with Mary for five years, has been in the United States for nine. In her native country of Ecuador, she raised her son who is now a student at St. Benedict’s Prep. While in the process of raising a second child, she is now putting her talents to forming a new organic cleaning business, “Magic Hands Touch.” Along with the help of the Community Center of Newark, Mariana is about to launch her website and will soon be off and running with her 22 employees. Mary has offered Mariana support all through the process. “Miss Mary teaches me very well and when I start to work I can communicate better,” Mariana said. 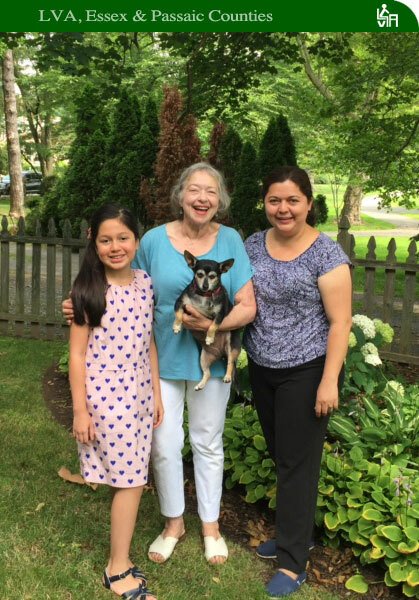 Ligia, second to join Mary’s group, has been in the United States for 11 years since moving from Ecuador. She is currently a stay at home mom and is raising her four-year-old daughter. She finds this new challenge quite different from her position as an accountant in her home country. She will soon have to navigate the school system. Ligia is very enthusiastic about working with Mary. “I like to practice speaking English and I have nice people to practice it with,” she said. For now, this group of four is a smooth running machine, but Mary always welcomes new students with open arms and heart. LVA student Abir knew she had enough of violence and destruction in her home country of Syria when her ten year old son cried, "Please Mom, I don't want to stay here." Outside of their window they witnessed tanks, snipers, and people dying in the streets. The family's eventual path to the United States began with a move to Lebanon to live with an aunt and then on to Egypt for a year. Abir's husband brought their children, then ages seven and three, to the United States for a visit. Upon their arrival, both children exclaimed, "We want to stay here!" They were granted asylum. Abir, lamenting the waiting process said, "When I came to America I applied for asylum and it takes a long time." The family has lived in New Jersey for almost one year. That is when Abir connected with LVA. Abir and her tutor, Rick, have been working together for over eight months. They meet in the library as often as possible and are lovingly chided by LVA staff about being charged rent for their very frequent meetings and long sessions. One of Abir's main goals is to connect more with her children's teachers and become familiar with American customs. In October, Rick teased her about becoming fluent in Halloween. "Abir is becoming American very quickly," Rick said. Abir, a stay at home mom, acknowledges the importance of education. She constantly reads to her children to help them build vocabulary. "To be able to freely express yourself is very important," she said. "I am so happy. I like when I can talk to their teachers and their friends," Abir added. In turn, her children are very proud of their mother's achievements in such a short period of time. Rick takes his cues for lesson plans from Abir and her current needs. Together, they are working toward her passing her motor vehicle's test. Working toward attaining U.S. citizenship is a future goal. Abir, beaming with pride as she speaks about her tutor, said, "My teacher supports me a lot. He stays with me during bad situations. He calls me a superhero. He makes me strong." Wesley, Essex County Student of the Year, moves to the beat of his own drummer. Literally. A Florida native, Wesley made his way to New Jersey playing drums and piano in jazz and blues bands. Somewhere along the way, he did time in prison. But that did not hold him back from making some life changes, like furthering his education. Last June, Andrea began her ESL studies with Literacy Volunteers of America in our satellite program with Berkeley College. 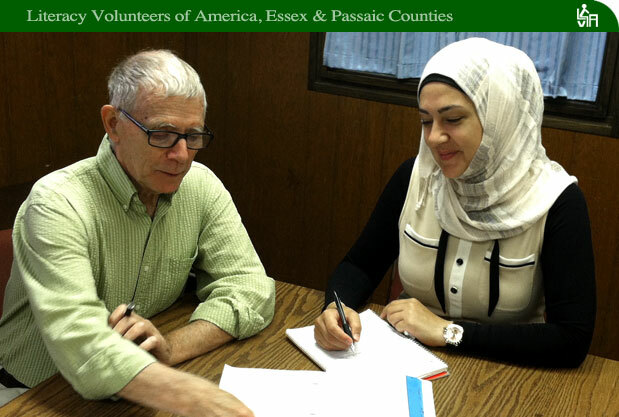 Her skills have advanced so well that she has become an LVA office volunteer and is also the Spanish language coordinator of the English-Spanish Language Exchange, a pilot project she helped launched for LVA, Essex and Passaic counties. The war in Syria is among the worst humanitarian crises of our time, with hundreds of thousands of lives lost and millions of people displaced. It’s a crisis that Manal knows well. The recent Syrian immigrant, an ESL student at Berkeley College in Clifton, said she wants to improve her English, in part, to make sure everyone else knows the gravity of the four-year war. “I need to talk to everybody here, the American people, ministers, everyone, and say we must stop the war in Syria,” Manal explained. By most accounts, Manal is on track to become a fluent English speaker and, thus, accomplish her goal. In April 2015 she enrolled in the Berkeley College program, which was run by the college, LVA and Sussex Educational Foundation. Her intermediate class met two hours per night, four nights per week for 10 weeks. In July she enrolled in a second 10-week course and completed it in September. Manal, who holds a college degree in library and information systems, followed her three grown daughters to the U.S. in 2014. Back home in the Syrian capital of Damascus, she managed an art studio and a small orchestra. But, as the war progressed, much of her time was spent as a volunteer who aided Syrian children and families devastated by the fighting. She volunteered at schools that also served as shelters for families that had fled bombed out neighborhoods. “There were people with no homes and no food,” she said. One of those shelters was also bombed a short time before Manal arrived there. Manal wants Americans to know that the Syrian crisis, a war that involves the government, armed opposition groups and extremist organizations such as ISIL, among others, is not hopeless. 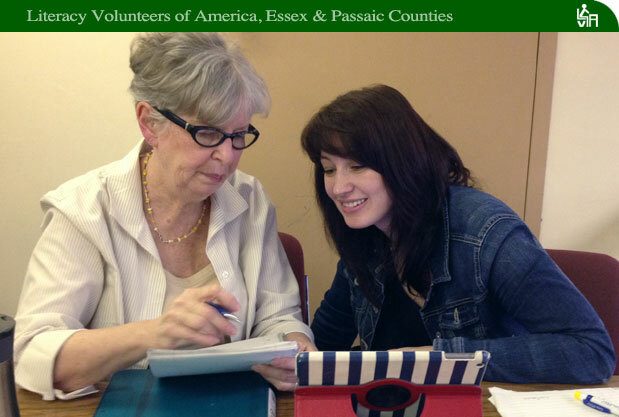 Students come to Literacy Volunteers of America for many reasons. Beralia’s was her young daughter, Nataly. Education is key for Beralia, who was a teacher in her native Honduras. But when her daughter, Nataly, started elementary school, Beralia could not communicate with her child’s teacher. Today, when she’s not overseeing payroll and tax operations at a local accounting office, Beralia not only volunteers in her daughter’s third grade classroom, but also uses her skills to participate in extracurricular activities at Nataly’s school. Most recently, she designed a game and made her prized cupcakes for a fundraiser. Both mother and daughter have demonstrated exceptional learning skills. 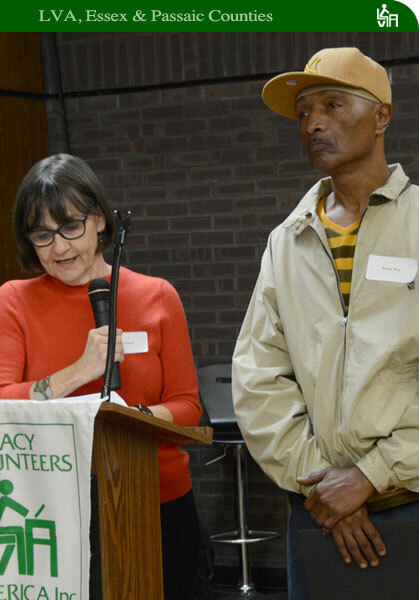 After being in LVA for only two years, Beralia won the organization’s Personal Goal Achievement Award. And Nataly has completed four programs for gifted and talented students – two at her school and two at Montclair State University. Joan began her early sessions with Beralia by introducing grammar, civics, and vocabulary. After Joan realized how quickly Beralia grasped these concepts, she included English conversation, idioms and reading comprehension. Joan assigns material for Beralia to read and in response, Beralia writes a summary. This approach has worked well for her, as Beralia has advanced from her status as an ESOL student, which focuses on speaking and understanding English to a Basic Literacy student, which concentrates on reading and writing. day to cultivate cassava, yams, beans and peanuts. She also helped her parents sell and trade goods at the market. That left little time for a formal education; in fact, it left her none. Esther eventually left the farm and, as an adult with five children to support, started her own restaurant. She spoke what she describes as “broken English” but had neither learned to read or write in Nigeria or in her first 11 years in the US. 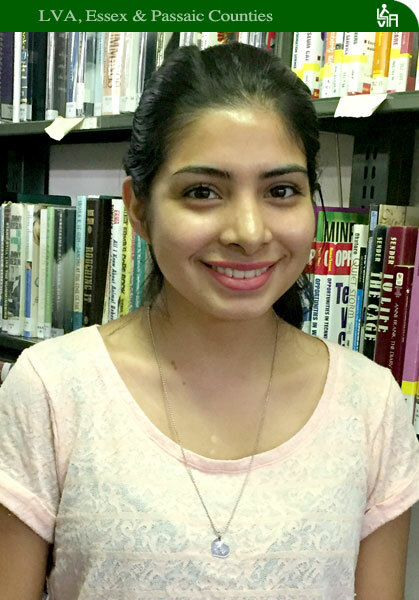 In late 2014 she enrolled as a basic literacy student in LVA and soon set her sights on becoming a U.S. citizen. 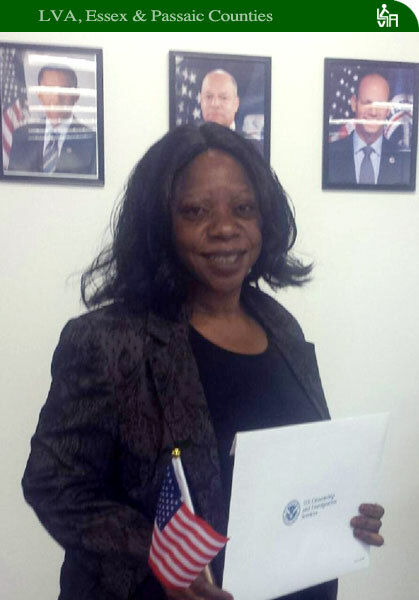 She took the citizenship test last March, after only a few months of study, but failed. When she became eligible to retake the test six weeks later, there was never a question about whether or not she’d try again. She passed the test in May, on her second attempt, and after only about five months of work with her tutor, Anita Lutolf. The two meet at least 8 hours per month in a local library and Esther also completes work at home. Currently, they use material from “Reading Comprehension,” a book of vocabulary, word puzzles, stories and other exercises. They’re both thrilled with Esther’s progress and see a bright future ahead. “I am so glad I came here,” Esther said. They’ve worked together for just over a year, but Maryana and Artie Hymowitz don’t see themselves merely as student and tutor. They’re more like family, if you hear the two women tell it. “She is my American mother,” said Maryana, her smile broad and radiant. “She is my Ukrainian daughter,” added her tutor, Artie, as the pair exchanged hugs during a break in a recent tutoring session. Even this short exchange leads Artie to note her student’s progress. “We could not have had this conversation a year ago,” she said. It was then that Maryana, a native of western Ukraine, enrolled in LVA and was assigned to work with Artie. She had arrived in the US a few months earlier with little knowledge of English. In New Jersey, she lives with her husband, an American citizen from her Ukrainian hometown, and their children - a son, age three, and daughter, 17. But some relatives, including her mother, remain in the Ukraine, a nation now embroiled in war with Russia and Russian separatists. In the Ukraine, she was the manager of a popular local restaurant. Here, in Passaic County, she works as a cook in a Russian restaurant. She speaks Russian and Ukrainian and, thanks to her sessions with Artie, her English improves weekly. Their lessons don’t always come straight out of a grammar text boo. And they don’t always take place at a table at the local library. They’ve met at Michael’s, an arts and crafts supply story, where Maryana purchased materials for a scrapbook and other artwork she later constructed for her son. Artie sometimes helps. On another day, they found themselves at the Nevada Diner in Bloomfield. There, Maryana tackled a stack of red velvet pancakes for lunch, delighted that she could read the diner’s menu. Their friendship has even extended to their families. “They’ve had us at their house and they’ve taken us out to dinner,” Artie added. “A few weeks ago they came here and we made sushi.” The occasion was the birthday of Artie’s daughter, who speaks some Russian, and it amounted to a bilingual celebration. “It was a good experience for Maryana,” Artie said. Hard work, determination and an encouraging tutor have been the perfect recipe for LVA student Ryan Douglas. Ryan began work with Margaret Valentine less than four months ago. At that time, he was unlettered and now is studying for his United States Citizenship exam. “Amazing,” one might say. Yes it is, but Ryan is an amazing young man. Ryan grew up in Jamaica and was the eldest of 5 children. He had to become extremely independent at an early age and at 6 years old, cooked, cleaned and cared for his younger siblings. Ryan’s family encountered tremendous financial hardship and could not afford to send him to school. But, this did not stop his zest for learning. Ryan came to the United States to seek a better life and is now a materials representative for a local hospital. He rises at two a.m. to get to the hospital by four a.m. After putting in at least an eight - hour day, he then finds time to study and meet with Margaret. “I could not wait to become an LVA student because it was something I always wanted to do. I got Margaret as a tutor and it could not have gone any better, “ Ryan said. At their first meeting, Margaret expressed her amazement as to how well Ryan compensated for not being able to read. “For someone who has had no formal training,” she said, “I was very impressed.” Margaret acquainted Ryan with a picture dictionary and flash cards with consonants. Having the keen memory that he does, Ryan had picked up learning some letter names from his young friends in Jamaica. He drew upon this early memory and named words that started with the letters Margaret had written on flashcards. By building on this solid foundation, Ryan now knows over 100 sight words and has a word bank of over 300 words. He and Margaret are using the questions on the citizenship exam as study materials. Asata has been making steady progress as a student of English for more than a year now, and she does it one word at a time. A native of Monrovia, Liberia and mother of four, Asata has met at least once each week with a basic literacy tutor for the past 14 months. Admittedly, the journey hasn’t always been smooth, seamless or easy. 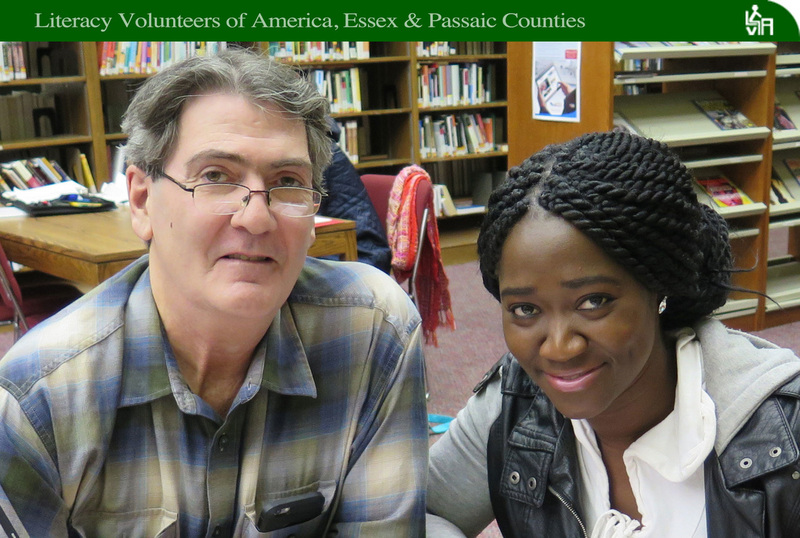 Literacy Volunteers of America, Essex & Passaic Counties, has registered students from most of the world’s nearly 200 countries, including Liberia. While English is the official language for commerce, Liberia is a multilingual nation where more than 30 languages are spoken. While Asata was well- versed in her mother tongue, Mandingo, she was unable to read and write English when she arrived in the US about 12 years ago. She registered for LVA classes in the fall of 2013. Her start was a tough one. On her first day, she got on the wrong bus from her Newark home to the Bloomfield Public Library, where she was scheduled to meet with tutor Mary O’Connor. Stranded in the cold on a Newark street corner, Asata called the LVA office in Bloomfield and tried to explain where she was. Mary, who was trying to locate Asata, was in the office when the call came in. “I think I know where you are, let me pick you up,” Mary told her over the telephone. Their meeting started less than an hour later. “And it’s been a smooth ride ever since,” Mary said. The pair started out with sight words, employing sight word cards that Mary devised for vocabulary and parts of speech. Eventually, Mary shifted the focus of their sessions to reading. “I really want her to get to a certain point in reading because that is one of her goals,” Mary said. Between lessons, they stay in touch through telephone texting, Mary said. That’s a new skill for Asata, and one she takes pride in. A year ago, she couldn’t write well enough to send a text message, she said. Asata works as a home health aide but dreams of becoming a hospital nurse. “The main thing, when you know how to read and write, you can go for a better job,” Asata said. Taking the test for US citizenship can be a harrowing experience for any student of English. It may take hours and hours of study before a candidate is ready. It can end in a few minutes, with a few questions from a test examiner who gives a nod of approval or turns a candidate away. When a literacy student takes the exam, test anxiety may be shared, not only between the student and family members, but also the tutor with whom the student has spent weeks preparing. And so it was with Bea Boyle when her student, Julia Baragone, took the test last September “I was waiting for her to call,” Bea said. “It was getting late and I was getting very nervous. I couldn’t even leave the house. It’s not easy to gain an appointment to take the test in New Jersey, with its vast number of immigrants who seek to become naturalized citizens. Of the 654,949 people who became citizens last year, 75-percent came from only 10 states, including New Jersey. The New York-Northern New Jersey metropolitan area is the nation’s leading area for all citizenship test takers. So it was important that Julia pass the test on her first attempt. In preparation Bea said that she tried to give Julia more material than the United States Citizenship and Immigration Services, which administers the test, makes available in its prep booklets and CDs. The test may be done but Julia’s still at work, focusing now on grammar, pronunciation and idioms with her tutor. She’s a full-time student at Essex County College, now in her final week of a certificate program in massage therapy and bodywork. She’s grateful for the help that Bea has given, she said, and has no plans to discontinue their session.